There are many cookie cutter bands out there in progressive metal today: These bands are predictable from their Dream Theater-style riffing to their “epic” song structures. However, there are always bands that are composing against the grain---“progression” in its truest form. Enter Minutian. 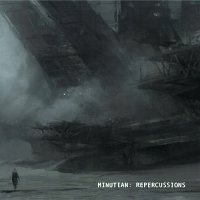 “Repercussions” is the debut album from Finnish metal band Minutian. This 7-track album showcases the band’s inclinations towards progressive metal, and displays their many influences, of which a few are King Crimson, Oceansize, Tool, and Mastadon. This eclectic range of influences definitely shows up in the band’s offering, and I was quite pleased with the mix. The band has crafted a great combination of heavy rhythm guitars; piercing, high-tuned lead guitar; off-tempo drumming; meandering bass lines; and bellowing vocals. The band even finds a way to insert some wonderful violin or tribal drums from time to time. Though I cannot say that this album is the most original or unique thing I’ve heard (even in just 2013), it is still clear that this is definitely not a band that is stuck in the same old Dream Theater formula. It seems that they will find their way to an even more creative path. Again and again, I was quite impressed by two things: atmosphere and restraint. First of all, Minutian has shown that they can create an atmosphere that is appropriate to their lyrical content. “Repercussions” is a very eerie, melancholy album---as it should be. The concept behind the album is that of desperation and faithlessness, and also the ways people treat you when you are in this struggle. Appropriately, the album has some spacey, unnerving moments where you can feel the inner struggle, but it also showcases some more bombastic sections. Second, Minutian has shown me that they can have some restraint. This is not a tech metal fest: This album is very deliberately paced. From the beautiful guitar work to the off-tempo, thoughtful drums; Minutian knows how to be complex, yet melodic and stunning. Many bands are complex for complexity’s sake, yet Minutian shows that they have the chops for it, but they hold back. This mature restraint has helped knock the atmosphere out of the park. “Repercussions”, then, certainly has some high points. Currently, my favorites are “Cold & Tight”, “Isolation”, and the instrumental outro “Three by Five”. These tracks are high points of musicianship, but they are also high points of composition, emotion, and concept. Yet, with any debut album, there are some drawbacks. Personally, I feel that the vox could use some work. While the musicianship is outstanding in both execution and restraint, I do feel that the vocals are not on par. I really had a hard time listening to the bellowing, earsplitting singer: He definitely reminds me of a mixture of Dream Theater’s James Labrie and Devon Graves of Dead Soul Tribe. In fact, there are times that he sounds like Axel Rose (that’s not a good thing for me). He just seems all over the place, though he does have his great moments; particularly in the more restrained, tender moments. Overall, the vox are inconsistent, but I feel that a little more maturity in this area could bring about great things on their sophomore release. Minutian is a project that should be watched closely. They have wandered slightly off the trodden path in their debut album, and this is something I want to see more. With “Repercussions”, Minutian has proven their chops and their ability to emote: With these two aspects, I expect further maturation and a great deal more imaginative experimentation in their next offering.